When playing a Satellite Tournament. At what point (if any) you stop playing hands, and just fold and let everyone else bust? Similar Threads for: At what point you start folding everything? I think you are there. The blinds are 2k/4k in a turbo, 85 players left, 100k stack, no worries. You could simply use your time bank every hand and choke out all the smaller stacks by playing slowly, making the blinds go up 2-3 times every orbit. Slow playing is very common with short stacks in a satellite. When people are close to the bubble a lot of the time they will use every second they can in the time bank to slow down the game. They hope people will bust out before them so they can cash. This is very effective with a big stack. There is a point that you can only hurt yourself. There is only so much you can win (25th place) and I think you are at that point. Then another 50 people before the ticket, I think that you can pull the time, short stacks will risk and quickly fly out, and if you can steal the blinds, the blinds will grow and your stack will melt, you just can not fold. Definitely can play a whole lot tighter. I wouldn't sit out completely just yet. You are down to ~26 BB and that will drop to ~17 at the next level. Not to big a deal if you stop now but you're not deep stacked. I would keep an eye on the bottom of the list as players get knocked out. You don't want to wait around for half the field to be knocked out and then find yourself on the bubble. Maybe walk away and come back in a Short time and just check in. my opinion should always be played, just try very tightly to steal the blind. re: Poker & At what point you start folding everything? I truly don't feel that should ever be a way of playing. With 25 entries getting paid you can stop playing when the tournament is down to 30 players if you are in the top five and only play big pocket pairs. play strong cards and knock out players with a small pot .. When sleeping, sitting out, disconnected. Dunno. 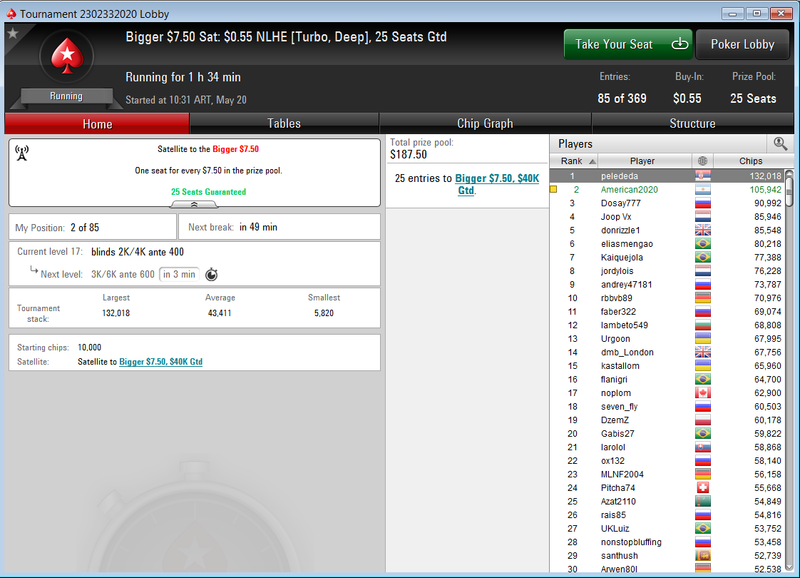 I left a freeroll 1st of 125 or so, came back and had finished 8th. Ok, with 25 Players getting in, with no difference between first and 25 place, I will start Folding everything but AA, KK, AK when there are some 35 players left; unless some other player with a Big Stack Shoves, then I will Fold even AA. You will get the same Prize as number one or umber 18, 24, So! Thanks guys for all the answers. Really learning a lot. As an update. I did not get a ticket finally :P I didn't stop playing hands, but I surely play tighter, but a couple of bad hands and I was short stack, and forced to shove all in a couple of times. The pace is really fast and I noticed anything can happen. In your original scenario you're not even close to making that kind of decision. Tourneys grind to VERY SLOW MO the closer they get to the bubble. That means by basically sitting out you're going to be paying a LOT of blinds and antes with no chance of adding anything to your stack. Anytime a think I will win a ticket by folding the rest of my hands I fold them all. Don't want to take a bad beat and lose my ticket. You overcame about 1/4 of the field of all players. But there is also only 1/4 places paid in the rest of this nearly 4 times more remaining players. Therefore I think, you are still too far away from prices to sit out. I would consider sitting out, if at all, probably only if there are about 40-50 players left, when there are payouts for 25 players. In the example, I would take advantage of the strengths of my chips and push the lower stacks to get a better slack. Given the situation, seems like it would be best is to be selective and strive to maintain/or better your chip stack. Just play good poker. You shouldn't stop trying to better your chip stack I think. Never - always look for a chance to make a move. Why stop playing? If you have an edge keep playing - just don't think that you need to be silly with a big stack. Maybe the only time is when you have a huge stack in a satellite and you are on the bubble with plenty of short stacks about to burst. LoL, he updated on why to stop playing. He ended up taking a few beats and not getting a ticket. I think there is a distinction on "sitting out" and "not playing". I don't think sitting out is a good decision, but I think playing slow and tight would have easily allowed him to make it. I think you did the right thing here and got unlucky. It happens. I think you were still too far away to just sit out and make it. You never do that. Just make your range ultra-tight and try get some blinds. The short answer is: never. I dont start folding everything till last 60 people in a Tourney and thats if you have enough chips to do so . its hard to fold everything in beginning because thats when i get my chip count up . At least thats what i try to do but it all depends on the circumstances . I agree with Da1Lokker - if you have great cards you must play the same as you always play a game - sure you wish to cash - but if you fold AA or high pairs you will end up changing your play - the time clock is there for a reason - so use it when you get near the bubble - big stacks always pressure you on the bubble!! In such tournaments on the bubble blinds reach about 20k. So, having less than 200-300k, I would not even have thought about that. At the same time, to go to the prizes it's enough to have about 80-100k. I would play more tightly, but aggressively. Periodically trying to steal the blinds. I fold everything then I am 15 place from money. Better to reach money then risk all for big fish.